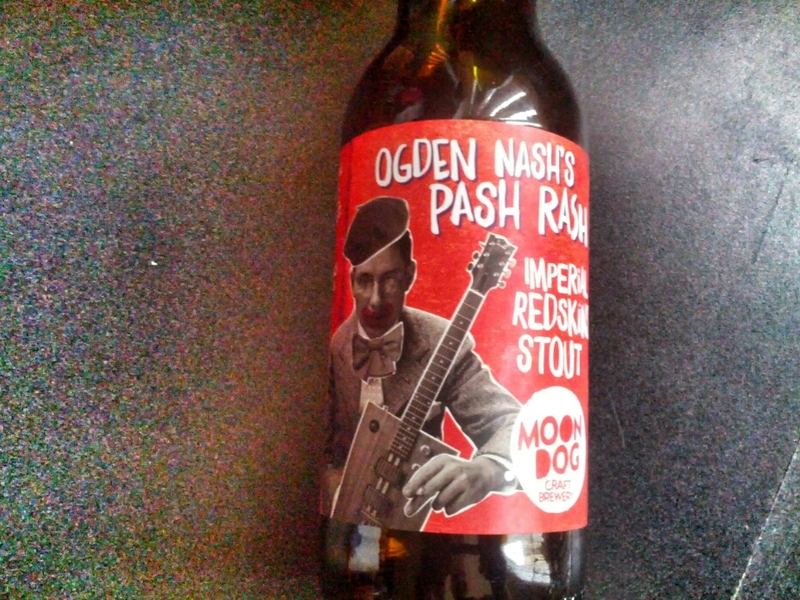 1) The actual name for this beer is Ogden Nash’s Pash Rash. I get the “pash rash” joke – the beer features Redskins, and pash rash gives you red skin. Geddit? But the reference to US poet Ogden Nash is a bit of a mystery. According to the internet, he did like rhyming, so maybe that explains the triple rhyme. Maybe not. Also according to the Internet, coleslaw is what killed Nash. He died after eating improperly-prepared coleslaw from which he contracted a lactobacillus infection. That infection then aggravated his Crohn’s disease. Who knew coleslaw could be deadly? 2) I had a long stint of steering clear of Moon Dog after I got sick of the inconsistent nature of their beers. I’d get one or two that were fine, but then a few would taste like there was an infection present. It was especially obvious when trying the same beer several times – the beer should have tasted the same each time but it didn’t. Not even close. And I know I wasn’t the only one taking a “once bitten twice shy” attitude when it came to Moon Dog. But it’s clear they’ve since fixed a few things up because the beers have become a lot more consistent recently. And consistency is good when it comes to making beer is a very good idea indeed. 3) I really wanted to try this beer because I’d made a Redskin beer myself a few months earlier. So I was sympathetic to the effort it takes to brew with a load of these raspberry lollies, not least because unwrapping each one individually is a huge pain in the keister. Though I really hope they didn’t have to unwrap all 5800 of the lollies that went into this beer. I was also keen to try another beer that featured Redskins. Mine was a pale ale and I found it a bit too sweet to drink more than one glass at a time. I did wonder how an imperial stout would go about balancing all that raspberry lolly sweetness. 4) It did pretty well at it .. for a while. The raspberry flavour is not anywhere near as overwhelming as it was in my version. And it did meld well with the big coffee flavours. But about the halfway mark I was getting sick of the Redskin flavour – much the same as I do with my own beer. 5) The takeaway from this is I only like Redskins in very small doses. And I need to give a bit more thought to the beers I make – novelty is fine for one bottle, but not when you’ll have to drink two crates of them.